In the ongoing quest to better myself, experience culture, and pursue mind boggling love, I moved myself to Santiago Chile back in February. I intended to do another “Random First Impressions…” blog but that time has passed so follow along as I ramble through my slightly more refined and matured impressions of Chile. When I arrived in February, it was hot. Real hot. A muggy hot which can only be produced by in a valley with enormous 3000 meter mountains completely covered in a 800 meter thick canopy of smog. Old Spice white stick deodorant gets on my shirt as I try to apply it without removing my shirt.) Socks are mandatory in the bed. My bed has six layers of blankets. I am currently writing this blog with an electric heater about 10 centimeters from my arm. But after a cleansing rain and a light breeze in the early morning hours, the snow capped Andes are a captivating view that will never leave my brain. The paramount marker to indicate the level of a society is to take notice if the wild dogs in the city are wearing clothes. 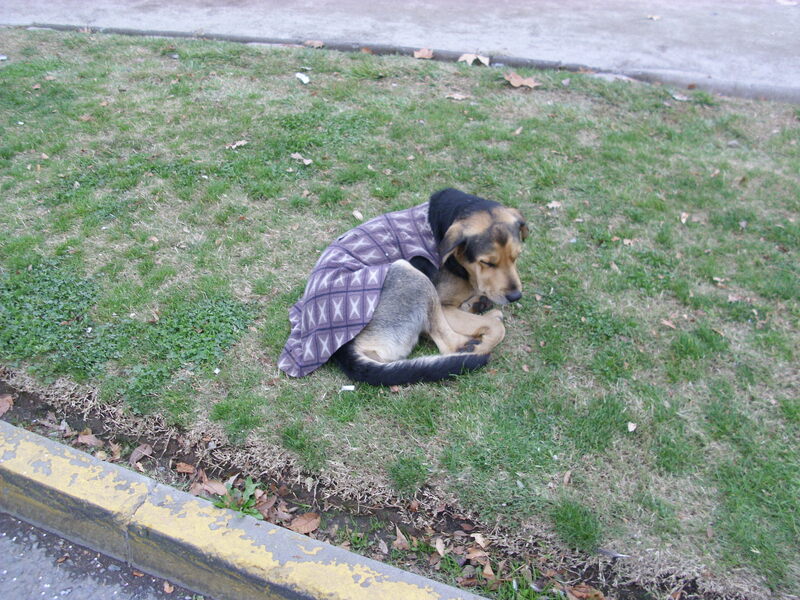 Almost all dogs, both with and without owners, are properly dressed to survive a cold Chilean winter. I have even seen a dog with shoes. Having said that, I have also seen three separate instances of a homeless guy taking a dump on the sidewalk. So there are some holes in my theory. In Chile, you have the Cuicos, the rich people, and the Fleites, the poor people. The fleite are a dangerous breed who will rob you of your pants and underwear in an instant. They will frequently ask you what time it is just to see what kind of watch you have. They like their reggae-tone loud and if a song sounds exactly like the song before it, the crazier they get. There language is fast and slurred and depends on phrases and sayings that would offend a sailor. They will burn a bus down to celebrate the victory of the Colo Colo football team. A Cuico is hard to find because no one will ever admit they are a Cuico for fear of being robbed by the Fleite. Cuicos like their American music and brag about the large selection of khakis they have in their new apartment. Their language is clear and precise and littered with English. 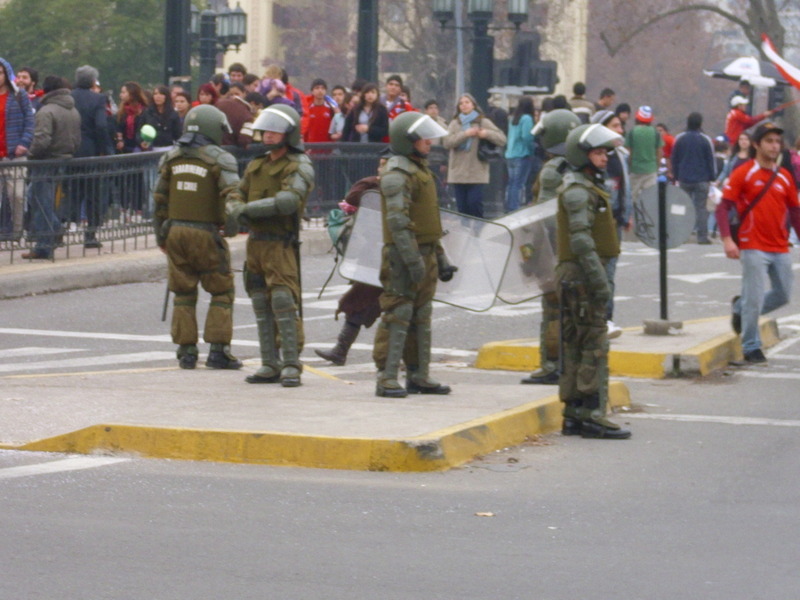 If the University of Chile football team wins, they might read about it the next day. Now, I am generalizing a little here and my sincerest apologies to both classes if I have offended you, but the point is that at the drop of a hat, a Cuico would bite the ear off a Fleite if given the chance and a Fleite would kick a Cuico in the shins if they got close enough to one. The hatred and fear of one another reminds me of 1840’s South Carolina. The Ciclistas Furiosas is the most police orientated critical mass I have been a part of. They directed our group of 200 down a very quiet and out of the way path. The total length was about 38 minutes going six kilometers. We frequently stopped at red lights. The cycle paths are way too thin and are lined with big 15 centimeter concrete blocks ensuring you destroy a wheel if you think you can squeeze past the baby stroller using the cycle path. The roads are resurfaced cobblestone if you are not on a major road and many times, are cobblestone. Cars hate you. Taxis want to hit you. Busses want to murder you. The busses are the very long articulated kind which sound like a star wars jet fighter as they storm pass you glancing you with their mirror. They will gas it to make sure they are in front of you before the next stop even though that means everyone in the bus is slammed to the front after he applies his brakes heavily, just to piss me off. They will always look at you in disgust as they pass. A shoulder does not exist on the roads here and the side of the roads are generally in worse shape than the inside. Having said all that, I enjoy dangerous cycling and squeezing myself between two wavering articulated busses at 50km/h, hanging on to the back of large lorrie trucks to take a breather, boring down on an intersection full of people trying to sneak across only to be missed by me and my Fuji by fractions of a second, sprinting down a two kilometer tunnel with the police behind me telling me that I cannot be in the tunnel, acting like I dont understand Spanish after two motorcycle cops pulled me over for riding too aggressively, racing a single bus across town to finally receive some sort of respect form the driver after I won… are good times and I am glad to be a cyclist. The nights can be long and it is very possible to party your nights away until 6am. A good place will ahve multiple dance areas. One area for the mandatory reggae-tone and cumbia, and another for more of the type of music you would get back in the United States. There is one library of music that is shared by every location in Chile so get used to hearing the same thing a lot. It is acceptable to play the same song three times in an evening. Drinks are made strong and should cost you around four dollars. Taxis are relatively cheap although drunk driving has the consequences equivalent to jay walking so many people drive intoxicated. There seems to be a lot of options … everywhere. You are never far from a place to inbibe or sing karaoke. But many of these places are empty. You must dance, no more hanging out on the side sipping a drink. You arrive, and you dance, then drink a little, then sweat a lot, then dance. It seems my dancing style is acceptable here althoguh very gringo-ish. Unfortunately Chile has been knocked out of the world cup. However, to live and feel the energy of a latin country engrossed by the fever of football is a magical experience. Win, lose, or draw, the people would gather in Plaza Italia to loiter, throw large bottles, jump and sing, and be generally violent. The police presence was imposing and very noticeable although they seemed to just let things go. The reason for that is they have this sneaky little inconspicuous truck everyone calls the skunk. When the party needs to be over, this truck sneaks up to groups of people, rolls down its windows as the people gaze at this weird looking truck, then gasses them with a high pressure gassing gun that can gas the hell out of a toddler from about 20 paces. The skunk is effective, albeit indiscriminate, and you can tell the police enjoy their job. Chilenos look like a mix of Native Indian and Oriental. Generally round faces with big dark eyes. At almost six feet, I am one of the tallest persons in the metro. Obesity does not exist but the men seem to develop a slightly pudgy build as they grow older. One of the first Chileans I spoke with was absolutely horrible to me and disrespected me badly due to my budding language. But since then, I have been fortunate and the people that I have come to know are all very beautiful people and day to day interactions are a joy. Very fast and with a lot of slang. They regularly add “-po” to the end of sentences which can be distracting at first to a novice ear. Their “dude” is “weon(a)” but the problem is that if used incorrectly, you can sound extremely rude and risk a face slap or worse. The intonation of their voice will range from a subtle mumble to a “daaaammmmnnn” in almost every sentence. They love to inject sexual connotation into many phrases. Spanish is a lovely language and much more effective and eloquent than English. Thank you to everyone who has been patient with me and helped me along my way to conquer this new language. In general, it is not cheap here. Most goods cost about the same and a trip to the supermarket seems to actually cost more than back in the US. But labor is really cheap. I can get my bike tuned up, cleaned, with wheel truing, for $10 bucks. I can get a four course meal for five bucks. You can buy very elaborate looking pottery for a dolalr making me think I want to have a party where everyone gets to break clay piggy banks that have prizes inside. As with every other country in the world, except the US, I regularly find a lot of coins in my pocket. ATMs need not to be trusted and if their is a sign that says it is not working, try anyways. About 50km outside of Santiago, you have a place that has stolen a part of my heart. Cajon del Maipo. It is a long slithering valley that pierces into the Andes. 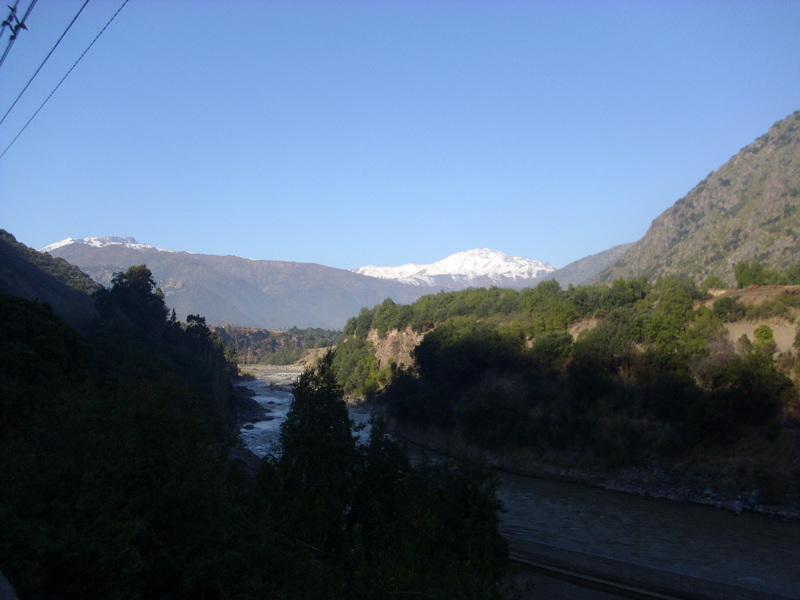 It is above the smog line and is accompanied with a fast moving river. I do most of my training here on the bicycle for visual inspiration. I hope one day to have a house here, I will make my front lawn a parking lot, and charge six dollars for people to use it. The port of Santiago is about 120km due West. The port can be split into two main cities. ViÃ±a del Mar would be the equivalent of Newport Beach while Valpariso would be the equivalent of San Francisco. The beach is not for swimming, only for looking. The air is clear and breathable and the people are warm and inviting. I was literally booed off the stage singing “I Will Survive” in a karaoke bar where the DJ actually made the record screetch to a halt to emphasize the crowds point. A chileno must have a jacket that has fur around the lining of the hood. Girls will always have black tights on. If you are Fleite your shirt has intentional splotches of paint strewn across it and your sweater has horizontal stripes with a dash of purple. If you are a girl and a frisky Fleite, you have painted your hair blonde to invite every cat call from every guy in the city. If you are Cuico, you have a wool pullover covering a single color collared shirt. Your shoes are black or dark blue and your big jacket is the shiny poofy kind or a long trench coat. Girls love their boots here and are very good at walking and dancing in heels. In general, not very colorful, except for my girlfriend who has red, yellow, and green jeans. It is not correct to call someone a friend if you just met them. It can be rude even to say someone is a friend if you just met them. EVERYone knows every song and EVERYone knows special dances. It is in your blood. Nothing can be purchased online and you must wait in long lines or go through very arduous processes to get anything done. Like all latinos I assume, very family orientated. Although I do see a lot of “man does man things, the woman does woman things” which I do not really like. It was a big deal one time when I said I needed to clean the dishes because the ladies were doing way too much work. A common vocation is to claim a road, and be its permanent parking escorter. If you park, someone WILL usher you out on to the street, even if there is no reason for it. And you WILL give that person a coin. I am really happy to be here and a giant Thank You to my girlfriend who has made this the best trip and best decision of my life. Previous Post -Dave’s Guide to Sin City: Vegas And Gambling Is Now Awesomer!